There is something really powerful about the way David Levithan writes. Combine that with a powerful story/event, and you come up with Love is the Higher Law. As someone who was only six years old when the September 11th attacks occurred (and I faintly remember where I was and what happened that day) it was really interesting to see the perspective, not only from teens who would have been my age now, but also from teens who were living in New York when it happened. I never saw the Towers in person before the attacks, and only visited the aftermath of the site six years later, so I can only imagine the magnitude of their presence and absence on the city. Ground Zero itself is enormous (from what I recall, and this was before the beautiful memorial was built too) so it must have been truly something to be in New York in 2001 on that fateful day. However, David Levithan weaves a beautiful and respectful story, and I think we need more stories like this. One’s that open up about all the emotions that swirl in our heads when events like this happen; because it’s raw and real. 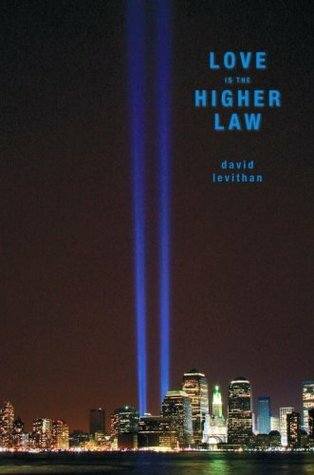 Spinning fiction into terrible facts I’m sure is not an easy accomplishment for any writer, but David Levithan was able to create a story that really tugs at your heartstrings. I think everyone should pick this up, no matter your age, because you can truly relate to the highly charged emotions running rampant through this short but powerful story.